In our press room, journalists will find current information on our company and its products as well as downloadable press releases. For editorial purposes, we offer high resolution pictures of KARE products and KARE living compositions. Please request your access to the image database here. For further information please contact our press department at the KARE headquarters. August 2017; With its ‘Green Loft’ photo motif KARE is among the finalists in the 2017 PR-Bild Award competition for impact-making photographic images. The Munich company is the only pure furniture producer to make it onto the shortlist. The prestigious jury selects 10 photos in each of six categories. With its ambience photo KARE is of course represented in the ‘Lifestyle’ category. 15. March 2016; We present current product favorites in our overview in March. 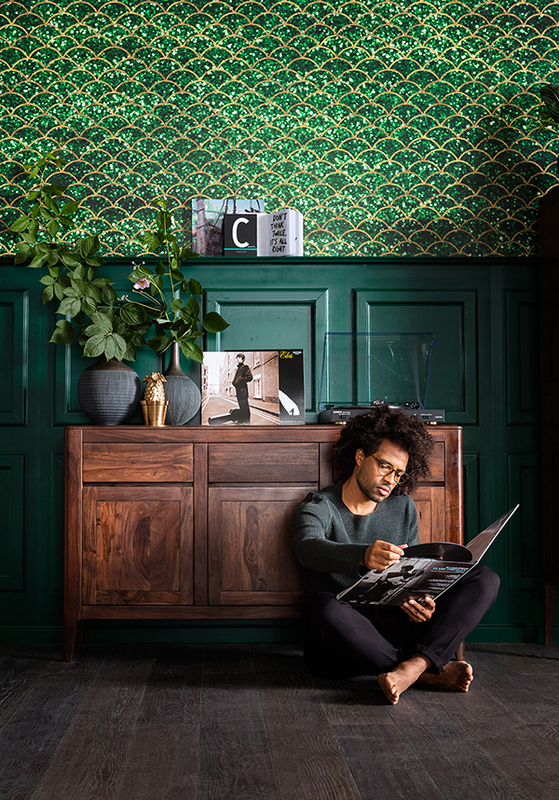 The “Romantic Nature” series displays romantic dream furnishing with decorative references to flora and fauna: for example a filigree forest as a coat stand and wall-mounted cupboards with botanical inspiration. “Beachclub” stands for unforgettable holiday sensations and innovative products, including a surfboard which serves as a hat rack. In “Shelves” we collected what our creative spirits have had on the subject of shelving. Send an email to presse@kare.de if you like to be supported with high resolution pictures. March 2016; Sustainable, natural, modern – as if it was created to provide everlasting furnishing delight: this is the Authentico collection from KARE. As one of our basic series, it is regularly enhanced by our furniture designers with new variants such as wall shelving in the shape of a speech bubble from the comics, or a shelf unit formed from crazily stacked cubes. This solid wood furniture with its stylish finish features contemporary design, robustness and a homely atmosphere – favourite pieces which we are always glad to have around us. 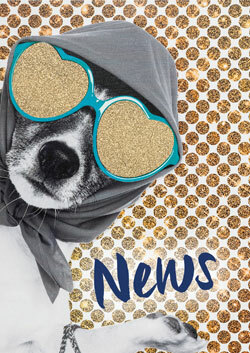 Read our press release under MORE and discover the Authentico online broschure here. For pictures please write an email to presse@kare.de. January 2016; In a skilful mix of styles whimsical fluffy chairs combine with wild-oak Scandinavian furniture; in a nomad tent, shelves with the curved lines of sand dunes are grouped into a furnishing oasis, and interior design celebrates the dining table as the furnishing star of the year – the Kare furniture brand brings the trends of imm 2016 into focus. Furnishing trend 1: the dining table takes a starring role as a communicative meeting place. Furnishing trend 2: that oasis feeling – the impulses behind the desert look. 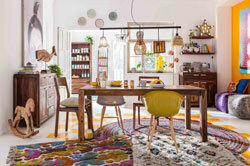 Furnishing trend 3: Joy of living – the tousled “Yeti” armchair meet the “Spaghetti” sideboard. 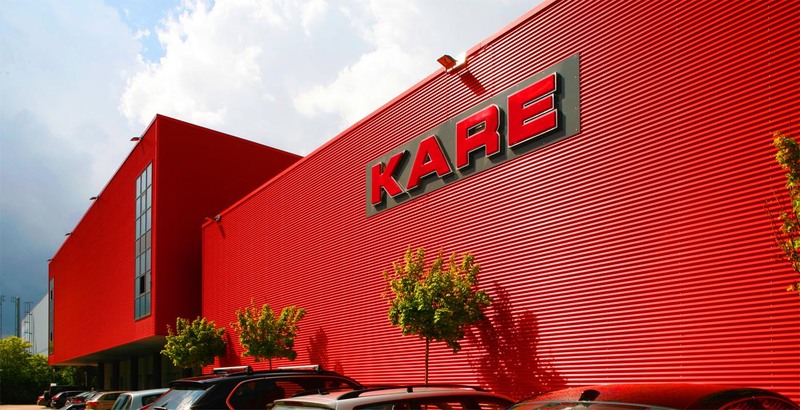 January 2016: The one hundredth franchise shop of the Munich furniture makers Kare recently opened its doors in Milan, the undisputed centre of international furniture design. This landmark opening demonstrates the continued success of the course taken by the design furniture brand with its franchise concept for furniture retailers. For the current year the company’s franchise division is already working on a number of further new store projects both in Europe and on a worldwide scale. 12. December 2015; The furniture company is enlarging its global network of brand shops by adding new countries and brand partners. Every two weeks new doors are being opened to the furnishing experience worlds of the Kare furniture creators. April 2015; The shapes are borrowed from the seventies, lines and forms are clear and with round edges. In a wild and crazy surrounding the key pieces offer an architecturally calmness.